I am digging in and getting my hands dirty here, going long FAZ, the triple-bearish ETF for the financial sector. Specifically, I went long FAZ at $12.34 with a protective stop-loss below $12, playing for the financials in the XLF ETF to make a lower swing high. This position amounts to roughly 4% of my trading portfolio capital. As we had discussed ad nauseam in my videos, the XLF has diverged from the major averages in not making a fresh high off the recent rally throughout February. 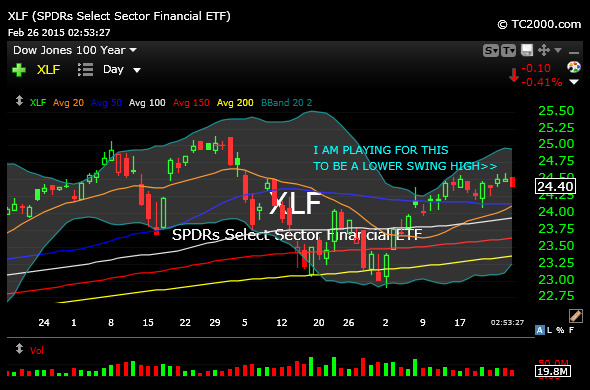 Keying off the likes or BRK-A, GS, WFC, etc., I am playing for the components in the XLF to cement that lower swing high, seen on the daily chart, below. If I am wrong, I have a well-defined area to recognize it, if bulls can remount that $24.60 area, just above--That is the main reason for my tight stop-loss.